Deerfield High School | Hutchinson Design Group, Ltd.
Project Type: The Township High School District 113 Deerfield & Highland Park High Schools roofing removal and replacement and masonry restoration project is unique both in its size of scope of work, construction cost and diversity of existing construction elements. The construction work entailed 15 trades, working as a team to achieve end results that are truly sustainable. Aged and deteriorated asphalt shingles on 4 original 1890’s construction were curling and splitting, and had long passed their service lives. (The original roofs had been slate.) The new steep slope roof system design incorporated thermal insulation, new roof sheeting, modified bitumen self-adhering ice protection and underlayment felts. Saddles to divert the water to the roof parapet through wall scupper were formed with tapered insulation and covered with polymer modified gypsum cover board and 90 mil EPDM. Adjacent parapet walls were clad in prefinished metal. 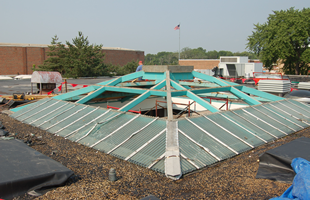 The low slope roof replacement work consisted of 13 low slope roofs totaling 64,450 square feet. The existing roof construction was composed of multiple coal tar pitch and light weight concrete roof systems averaging approximately 12” in thickness, with some locations up to 18” thick. Most of the existing roof drains and drain pipes were filled with coal tar pitch, requiring removal and replacement. The new roof system design focused on achieving long-term service life. As the existing roofing was removed, a temporary roof/vapor retarder consisting of a base sheet overlaid with smooth surface modified bitumen was installed. 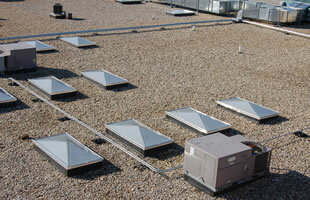 Following the installation of the vapor retarder, all existing roof drains were removed and replaced with new. Furthermore, new roof drains and piping were installed to assist in the ease of installation of the tapered insulation. All roof curbs were raised, roof top units disconnected and lifted of the roof, curbs and ducts removed and the roof edge raised to accommodate the new tapered insulation. The new roof system consisted of 25 psi ¼ per foot four way tapered insulation, overlaid with ½” polymer modified gypsum cover board, all set in hot asphalt. 60 mil EPDM was installed, and all lap seams covered with a cover strip. Masonry restoration of Highland Park High School included: tuckpointing, new expansion joints, sealant removal and replacement, installation of new through wall flashing systems and the removal of 110 year old corroded steel lintels embedded in masonry walls. Wood windows from the 1890 construction were removed and replaced with new thermal glazing with low e-coating and prefinished thermal frames.